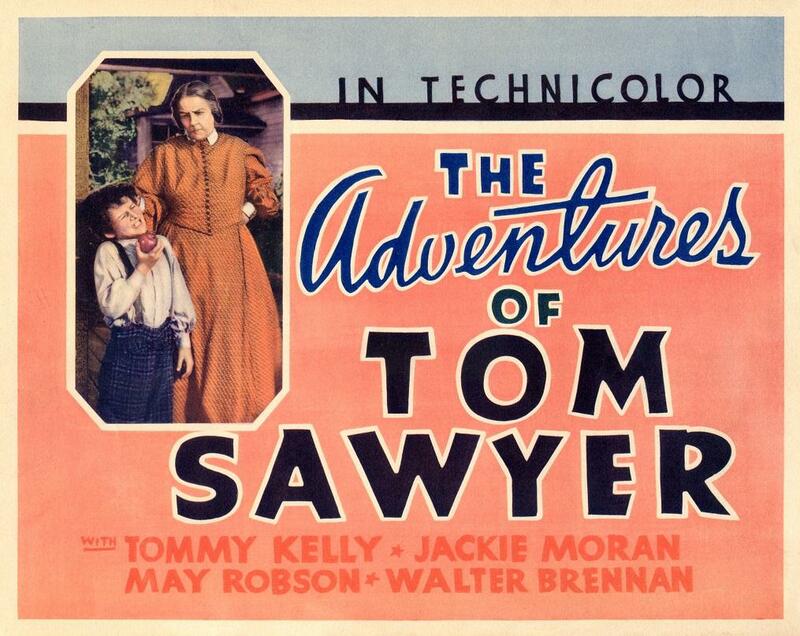 May Robson as Aunt Polly abuses Tom Sawyer's left ear in a 1937 lobby card for David O. Selznick's Technicolor motion picture of THE ADVENTURES OF TOM SAWYER by Sam Clemens. Twain Memorial Bridge. This lid came out looking green in the scan so it needed adjusting to make it look more like gold. River water into the Rivers of America and adding a quantity of soil from Jackson's Island to Disneyland's new attraction. Counter display insert 7 x 9 inches for Mark Twain Showboats (cigars) "4 for 50 cents." Likely from the 1930's. This profile of the steamboat appears to have been influenced by the Sacramento River style with the curved front pilot house and enclosed sternwheel. The twin 'stacks were likely derived from the remodeling done by Hollywood in the 1930's for films like STEAMBOAT ROUND THE BEND and SWANEE RIVER. Sam Clemens "Mark Twain" was famous for his devotion to cigars and he claimed to have begun smoking them when he was still a boy in Hannibal, MO. Attached composite I made in 2010 with a caricature of the boy Sam Clemens smoking a huge cigar and towing a toy steamboat with a string behind him. 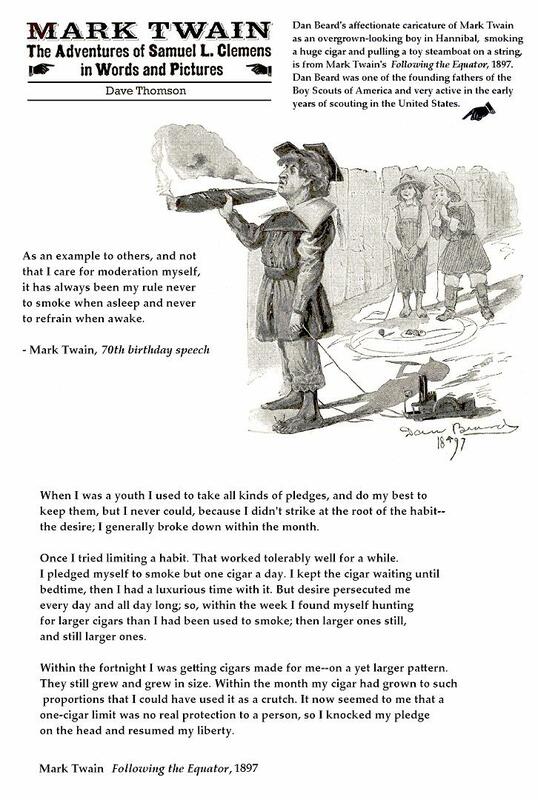 Quotations from Clemens regarding his adventures with tobacco are included. Attached detail from one of Lynd Ward's painted illustrations for a "juvenile biography" of Sam Clemens written by Ward's wife May McNeer. 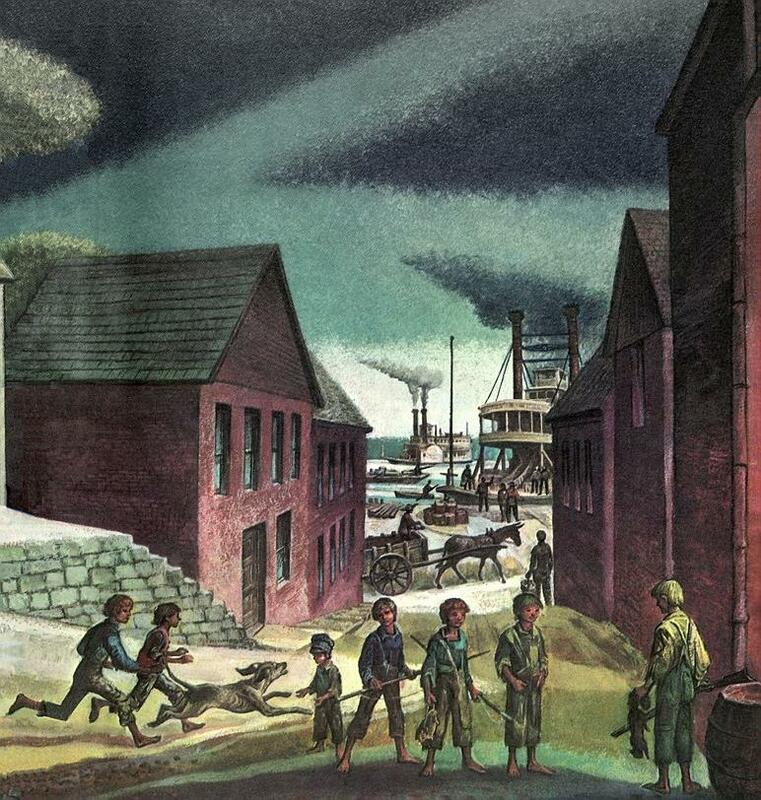 Ward depicted Sam and friends in Hannibal, Missouri on the Mississippi during the 1840's but he took a bit of liberty in the research in that while the steamboats are faithful to the period, the buildings in Hannibal were based on a photograph from LIFE magazine taken in Hannibal in the 20th century that didn't exist when Sam was a boy if you compare them with the location in the detailed 1854 map of the town. It is said that Lynd Ward decided to be an artist when, in the first grade, he realized that "draw" was "Ward" spelled backwards. He was born in Chicago in 1905. He studied art at Teachers College, Columbia University and graduated in 1926. He married May McNeer the week they graduated and immediately sailed for a year in Europe. Ward was an incredibly prolific artist who illustrated many books for children and among other biographies of famous Americans for young readers that he illustrated were the lives of Paul Revere, Ulysses S. Grant & Robert E. Lee; literary classics including Swiss Family Robinson and Johnny Tremain, and adult classics such as Robinson Crusoe and Frankenstein. 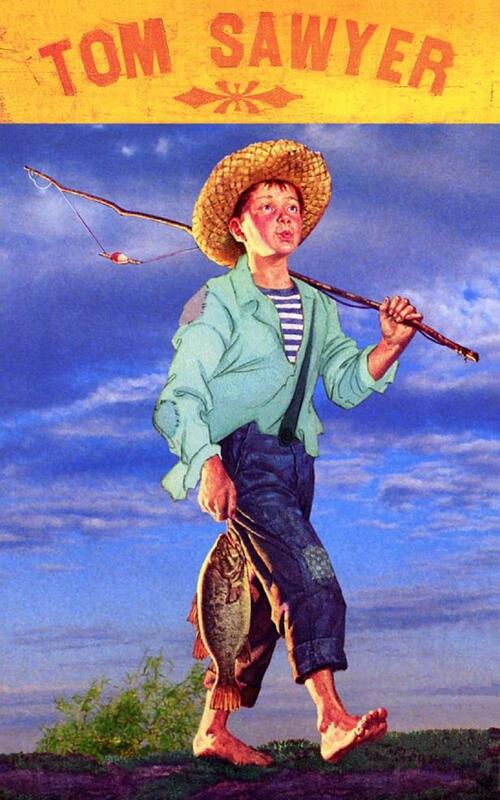 This composite was made from a Budweiser ad of a boy fisherman wearing a straw hat who looked like Tom Sawyer but needed an additional shirt to wear over his striped T-shirt so I took a shirt from an illustrated Italian edition of TOM SAWYER. The sky is a detail from a photo taken over the Mississippi at Baton Rouge, Louisiana. The lettering on the top is a detail from the TOM SAWYER ROOT BEER crate which my cats like to use as a bunk house. (We've got pictures of them somewhere in my wing of the museum). 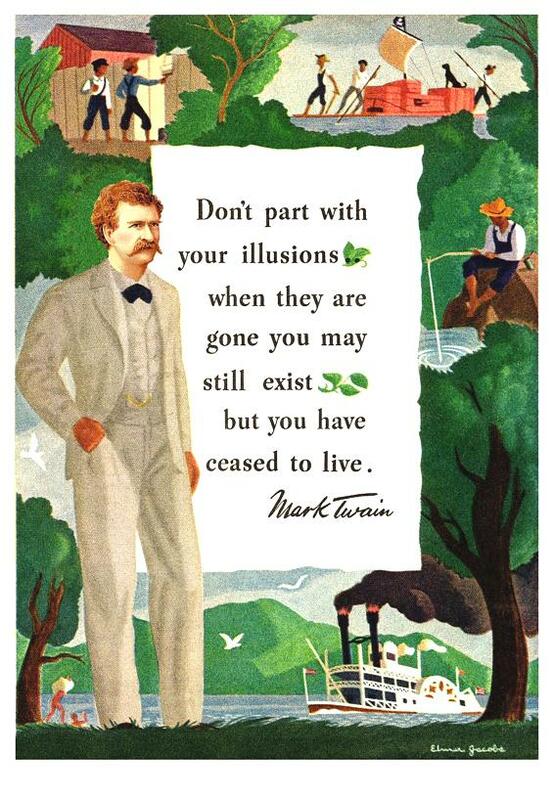 Artist Elmer Jacobs painted the attached presentation artwork circa the 1950's to which a quote from Sam Clemens was added. The face of Clemens that Jacob painted was not a flattering likeness so I replaced it with a graphic from the cover of a mini-biography published by Duke's cigarettes in 1887 when Sam still had the auburn hair of his youth before he aged into the white haired icon that the public remembers him as today. Jacob's graphics of the "whitewashing" scene upper left, the "boy pirates" upper right, the boy fishing, the boys heading into the river to swim lower left and the jaunty stylized steamboat lower right are nostalgic evocations of Hannibal, Missouri (which Sam Clemens renamed "St. Petersburg" in his boyhood novels about Tom Sawyer and Huckleberry Finn and their adventures on the Mississippi River.